Technical analysis of the agricultural input sector along with some potential swing trade ideas within the sector. The following stocks are covered in this order: RKDA, SNES, CGA, MBII, AGFS, IPI, UAN, AVD, SMG, ICL, CF, FMC, MOS & NTR. Required Silver or Gold Level access. Thank you for the inclusion of Nutrien, the fertilizer giant of Canada and merger of Agrium and PotashCorp. I was long them last year, $58.75 -> $72. Solid company that pays a pretty decent yield. Solid sector moving into the spring and summer months. 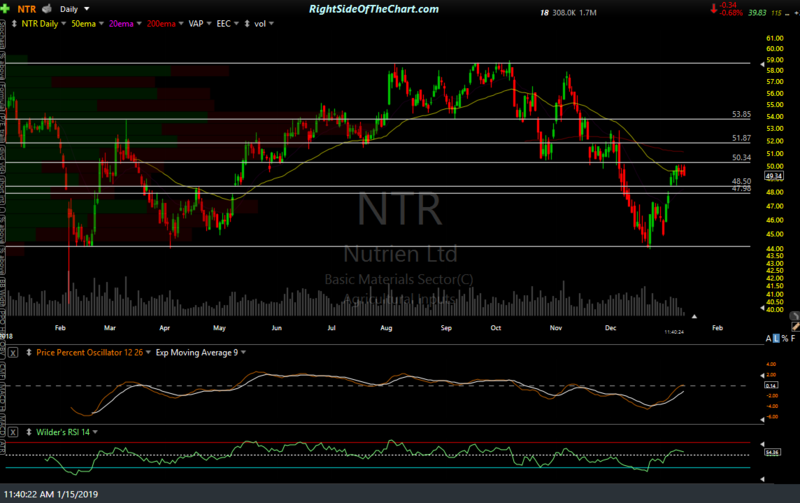 Y.W.- Here’s that daily chart of NTR with some additional support & resistance levels, including a support zone around 48.50 -48.00 that might offer an objective long entry on a pullback, assuming the sector holds up. Thanks for those additional support and resistance levels. Depending on market and sector sentiment I’m thinking about taking on a bullish swing position upon a gap fill down to $63.50-64 level on the TSX. Still seeing negative divergences on PPO/RSI on the hourly/daily from previous runs and having not getting into any longs on the oversold capitulation selling there’s certainly a reluctance going long near the top of the range. Might just have to wait for the month to play out sitting on the hands, frustrating yet a solid test of patience which is of course the mark of a successful trader. Fairly aggressive selling today albeit the volume is paltry so someone appears to be taking profit by the looks of it. NTR really exploded out of the gate without looking back after retesting it’s 50 day EMA on the hourly @ 49.34, never came close to 48-48.50. Everything is just so overextended right now, hard to make any case to go long even for short term upside. @ $51 there’s a whole heck of a lot of resistance, would have to think it makes a turn back here … just like everything else in the market lol.